The long Easter Weekend is near, and everyone is busy planning their entertainment getaways. 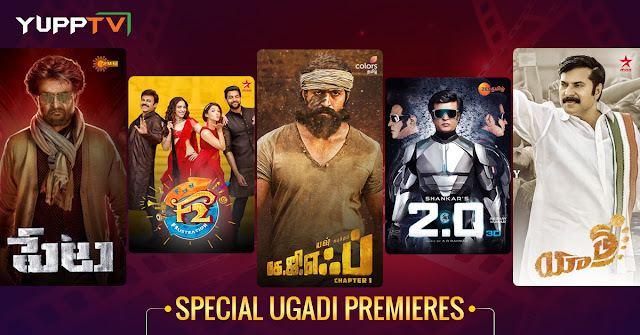 As always, YuppTV is here with the list of latest movies that are going to be aired this weekend for those who are planning to enjoy a cozy weekend in the warmth of their homes. 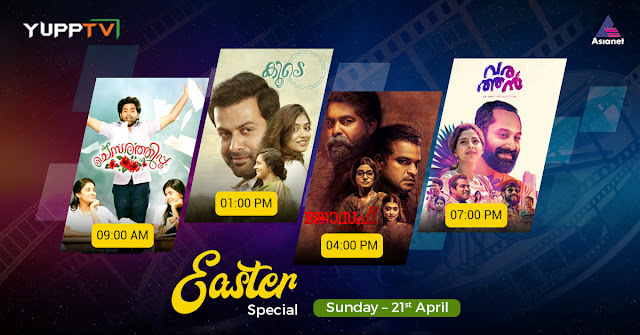 This weekend we have selected the best of Malayalam movies that will be on air on the festival day for you to enjoy with your whole family. Check them out and take your pick. Starring Prithviraj Sukumaran and Nazriya Nazim in the lead roles along with Parvathy, Koode is a psychological Drama directed by Anjali Menon. The film was released in July 2018 and received high ratings from the critics and audience alike. Though Koode is a remake of a Marathi film “Happy Journey” it owns the story and resonates perfectly with Malayalam people. The stunning performances of the lead cast is an added asset to the wonderfully weaved story and its brilliant narration by the director. This film is a perfect watch for any movie lover on any day. Watch it on Asianet at 01:00 PM IST on Sunday. Another great film from the Malayalam Film industry, Joseph is written by Shahi Kabir and directed by M Padmakumar. Joseph is a Thriller Drama starring Joju George, Dileesh Pothan, Irshad, John Antony, Sudhi Koppa, Athmiya, etc. The film was released in November 2018 and was one of the biggest blockbusters of the time. Joseph narrates the story of an investigative police officer that lands himself in the midst of a case after his ex-wife’s sudden death. The film received some of the best ratings from the critics and was one of the few films that completed 100 days in movie theatres in recent times. Joseph will be on air on Sunday at 04:00 PM IST. Starring Fahadh Faasil and Aishwarya Lekshmi Varathan is a Survival thriller film written by Suhas- Sharfu and directed by Amal Neerad. The film narrates the story of a married couple who return to Kerala from Dubai as the husband loses his job. The remarkable turns the film takes as the story progresses makes Varathan an edge of the seat thriller and a must watch. It was released in September 2018 and was marked a Super Hit everywhere. This film is going to be aired on Asianet on Sunday at 07:00 PM IST. From April 11th the biggest Democracy of the World decides its leader in Lok Sabha Elections. Given India is one of the most influential countries of the world that recently put itself among space superpowers of the world, the election of its leader is a spectacle the whole world will love to watch. Lok Sabha Elections are scheduled to happen in 7 phases across India. Phase 1 elections are scheduled on 11th of April, phase 2 on 18th, phase 3 on 23rd, phase 4 on 29th of April. Phase 5, 6, and 7 will happen on 06th, 12th, and 19th of May. The historic day on which counting is scheduled is May 23rd. Many states like Telangana, Andhra Pradesh, Arunachal Pradesh, Uttarakhand, Meghalaya, Mizoram, Sikkim, Nagaland, Chhattisgarh, Delhi, Goa, Gujarat, Kerala, etc., will have elections in the single-phase itself. States like Assam, Bihar, Jammu and Kashmir, Karnataka, Maharashtra, Manipur, Odisha, West Bengal, etc., have their elections in more than one phase. As is common knowledge Bharatiya Janata Party (BJP) and Indian National Congress (INC) are the major political parties in India. BJP had won a drastic majority over INC in the elections 2014 and is in service currently. Narendra Modi of BJP the former Chief Minister of Gujarat is currently the Prime Minister of India. Rahul Gandhi, the president of Indian National Congress Party is the leader of Opposition. Given the current political situation in the country, BJP holds a massive majority over INC in the parliament. The situation in the present elections might change and INC might win a significantly higher number of seats in 2019. Though the analysts are predicting that BJP might form a government again, the results might be surprising. Some states like Arunachal Pradesh, Andhra Pradesh, Assam, Madhya Pradesh, Odisha, West Bengal, Kerala, Bihar, UP, Uttarakhand, Meghalaya, Nagaland, etc., have their Assembly Elections alongside the Lok Sabha Elections. Since the state government elections have a significant effect on the majority won in the central government, these elections have become a hot topic too. 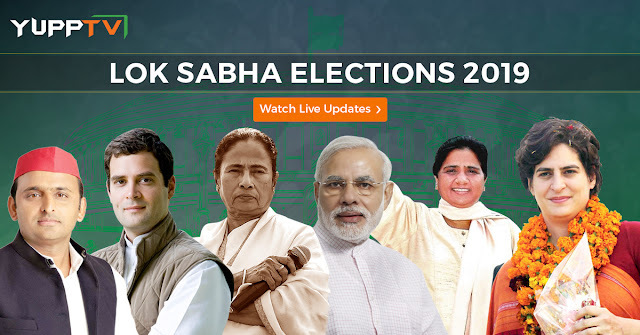 Watch all the updates on Lok Sabha Elections 2019 on most popular Indian Channels on YuppTV. Many of the channels are available to watch for free from all over the world. Download the YuppTV App to watch all the Indian News Channels Live on Smartphones, Smart Televisions, and other internet-enabled devices.